Press Release: Happy 5 Year Anniversary! Five years ago today, a3Genealogy not only began a company blog, but officially opened the doors to clients. We thank all of you who have journeyed with us! Our first large client was a celebrated Napa Valley Vinter who has continued using our research services to plan Ancestral Trips and provide Vinter History of Napa! He has been diligently uncovering generations of family tree branches from North Carolina, Missouri and California to Germany. We particularly loved our Aussie Forensic Genealogy case that had a happy ending. Oh, and let's not forget our clients who partner with a3Gen Research Services for their historical and family history writing projects. Our public presentation, Saving Alice: Sharing Your Family History is based on one energetic Illinois client who is a prolific family history writer and believes in saving the legacy and memory of ancestors. In spite of being known for our Media work - History Channel, Who Do You Think You Are (NBC and TLC 2011-2013) and PBS, Finding Your Roots, our bread and butter is Military History research which recently led a3Gen to offering full Veteran Service division out of St. Louis dedicated to retrieving veteran records. One of our newest military projects concentrated on the Texas Revolution. Researchers on this project have uncovered documents and collections in the most obscure repositories. We are looking forward to the next 5 years of blogging, researching, writing and to meeting the higher demand of our Speaker Series and Corporate and Entrepreneurial Alliances (CEA). As we grow and expand our services, we expect to see you there. You've always been there. Thanks to the a3Gen Researchers that have made this happen! 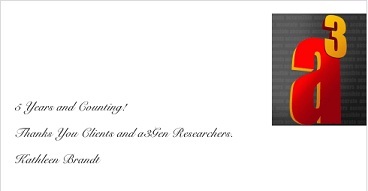 And thanks to the clients that have put their trust in a3Genealogy's Premier Services. a3Genealogy research jobs are assigned based on clients' needs. Research applicants should meet the following requirements: 1) expert in research topic 2) familiarity with local repositories and 3) location requirement. Interested in joining the a3Genealogy Team? Attending FGS, 2013? Bring your resume! Onsite interviews. Kentucky. Looking for researcher specializing in Deed and Title research in Owen and Gallatin Counties Kentucky. Locating ancestral land on present day map, a plus. Objective: Using maps and deeds, researcher will pinpoint land location of client's ancestor. Time Span: 1803 - present. Objective: Create research plan for client to successfully complete DAR application. Our traveling performing ancestors - dancers, circus performers, magicians and musicians – did not leave a permanent resident, except for their final resting place. So what are a few tips to researching these transient ancestors? Many of these performers were only known by their stage name. As the proverbial phase goes they may have “ran away to join the circus” and most often were estranged from their families; no longer having contact, unless their show came through town. The culture of the traveling showperson requires innovative research skills especially after the popular 1793 inception of the American circus. Circus World Museum Foundation. Circus World contains “a huge collection containing rare photographs, posters, manuscripts and artifacts and information on over 2,800 American circuses, and a reference file of over 300,000 names of circus performers and employees,” according to the website. The Wisconsin Historical Society owns Circus World and its collections are independently managed by the not-for-profit Circus World Museum Foundation. Mount Olivet Cemetery, Hugo, Oklahoma. Hugo a winter circus home of many circuses to include Carson & Barnes Circus and Kelly Miller, earning the name Circus City, USA. . Mount Olivet Cemetery is also the final resting place for many professional bull riders: Bull Rider's Reprieve the final resting place of rodeo star Freckles Brown. Showmen's Rest in Forest Park, Illinois holds a 750 plot section at Woodlawn Cemetery where a mass grave of 56 (or perhaps 61) employees of the Hagenbeck-Wallace Circus were interred. Showmen's Rest at Southern Memorial Park, Miami, Florida boasts the largest cemetery plots. Newspapers. Local newspapers often shared news while circus was in town. A Circus Wedding Readers of the Seward Reporter on August 9, 1883, learned of a recent wedding in the community in which the bride and groom were not area residents, but members of a traveling circus then performing in Seward. "Last Sunday evening nearly all of the employes [sic] of S. H. Barrett & Co.'s show were at the Grand Central Hotel," said the Reporter, "to witness an event which is a novelty in circus performances-the wedding of Mr. Frank Whitlock, one of the attaches of the circus, and Miss Lottie Grant, the fat woman. "Landlord Underhill gave the party the use of his dining-room for the ceremony, and the circus people filled it to overflowing. The ceremony was performed by the Rev. T. L. Sexton, after which the happy couple received the congratulations of their friends, refreshments were served, and a merry time generally was enjoyed. "The bride and groom received many handsome and valuable presents, among which were a diamond ring, an engraved gold ring, a gold locket, a fine photograph album, an autograph album, a dressing case, several articles of silverware, and a large number of smaller articles. Accompanying the gifts was a letter of congratulation from the members of the company. "The bride is an attractive feature of the show, being remarkable for her size. She is 27 years old, 5 feet 8 inches tall; and weighs 593 pounds weight. He is a fine-looking young man, and is spoken of very highly by his associates. He is superintendent of the annex or side-show department. The bride is said to be quite wealthy, although probably she is hardly worth her weight in gold." The groom, Frank Whitlock, listed in contemporary entertainment publications as a "museum ticket agent" and "side show talker," was probably not as well known as his new wife. 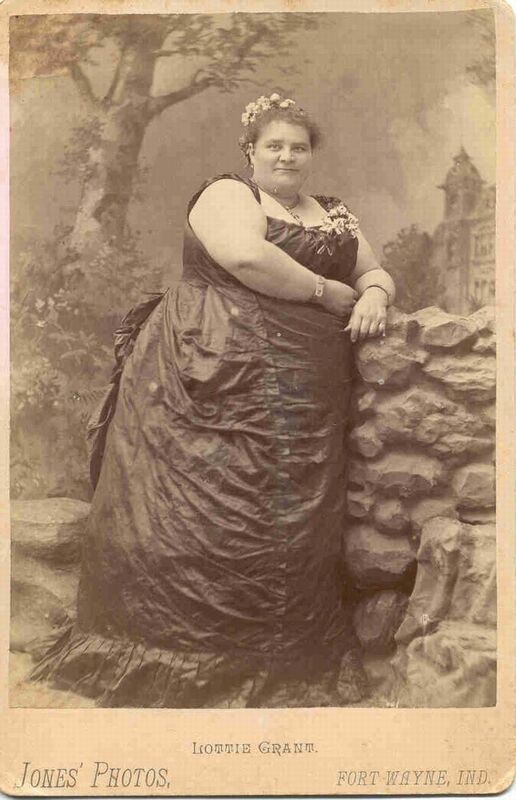 Elizabeth Charlotte Stice Whitlock, who used "Lottie Grant" as a stage name, was a well-known circus fat lady, who traveled with several different shows during the 1880s and 1890s. Her circus career did not prevent her from marrying three times and giving birth to several children. Some newspapers, like the New York Clipper (later Variety), 1853-1920, published circus articles of interest, often naming performers. National Fairground Archives, UK. Whereas the UK has a National Fairground Archives housed at the University of Sheffield, the USA does not have an equivalent. The Archives houses the following newspapers (microfilm) and will also assist in the research of your UK performer: World's Fair, 1904; The Showman, 1900-1912; and The Era. Disclaimer: a3Genealogy has completed extensive research on the Stice Family. Flip Pal coupon code (click on image). Promotion: $20 discount on The Flip-Pal Mobile Scanner with Craft Edition 2.1 DVD! This is normally $199.99, but with this coupon code, customers can get it for $179.99. The Flip-Pal is considered a flatbed scanner (in most repositories) and can be safely used with original documents. Perhaps this is why repositories that previously have not allowed scanners to be used in the past are now allowing the Flip-Pal Mobile Scanner. The traveling scanner of a3Genealogy! Happy 50th Birthday ZIP Codes! Have you ever wondered how your ancestors received their mail across the USA before the 1963 five (5) digit Zoning Improvement Plan (ZIP) code? Of course 124 larger cities were assigned 1 to 2 digit zoning codes as early as 1943, during WWII. But now, the 5 digit zip code is instrumental to every day life. The Census Bureau even uses ZIP codes to analyze demographic data. 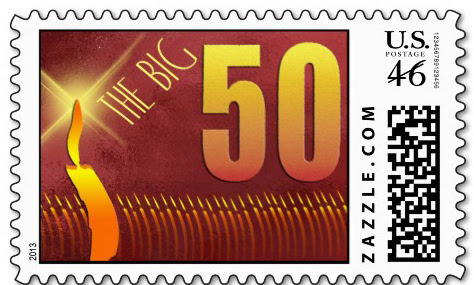 Happy 50th anniversary to the ZIP code - July 1963! For more information: Visit the USPS website.